Each year we have a little contest with some buddies of ours. We call them the “enemy camp”. The bet each year is simple. The biggest deer takes the prize money. The biggest deer shot in our camp this year was mine (see my previous blog post below). We were feeling pretty good until the enemy came rolling in with this guy in the back of the truck. My deer would fit inside the rack of this guy. Looks like the enemy camp will be collecting on anther bet this year. That makes two in a row. Ouch!! 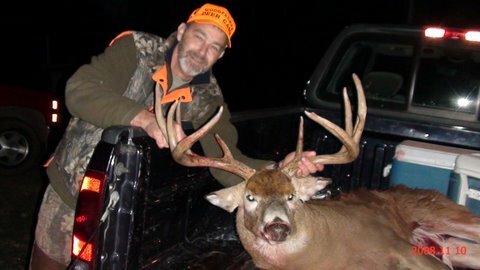 Who says that Minnesota doesn’t produce the monster bucks!! yes minnesota produces some monsters but not the quality and quantity of the states around us.these guys are lucky to be the few that do and congrats to you. we need different managment regulations and lottery buck tags instead of letting every joe blow shoot up the first thing with horns that walks by.most guys won’t let there buddy fill there tag with a spike if they’ve waited a fews years to get one.let em go so they can grow. great deer guys! well deserved and waited for i’m sure.